Vanee General Tso sauce is a sweet and fiery staple of Chinese cooking. 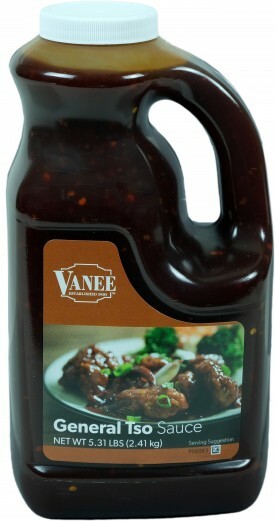 Most popularly used in General Tso’s Chicken, Vanee General Tso Sauce holds up well to breaded proteins and vegetables. It is perfect for wings, stir-fry, soups, dips, sauces, wraps, salad dressings, or apply directly as a glaze for all meats, chicken, seafood, or vegetables. Comes conveniently packed in half-gallon pour-friendly jugs; simply pour and serve. Vanee General Tso Sauce is gluten free and has no high fructose corn syrup. Each 64 oz jug has 67 two-tablespoon servings, for a total of 268 servings per case. Great for wings, chicken, stir-fry, dips, wraps, and salad dressings. Water, Sugar, Red Wine Vinegar, Salt, Hydrolyzed Soy Protein, Food Starch - Modified, Molasses, Garlic Powder, Spice, Dehydrated Bell Pepper, Corn Syrup Solids, Dehydrated Garlic, Oleoresin Paprika, Xanthan Gum, Sodium Benzoate and Potassium Sorbate (Preservatives), Caramel Color, Flavoring.